Every time I use my crock pot I wonder why I don’t use it more often! It’s so great to use in the summer so you don’t have to turn on the oven. 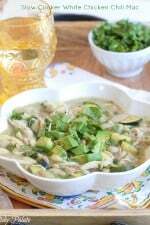 Have you had white chili before? It’s got all of the same great chili flavors but it is not red like traditional chili. There’s no chili powder or tomatoes which makes your chili that deep red color. 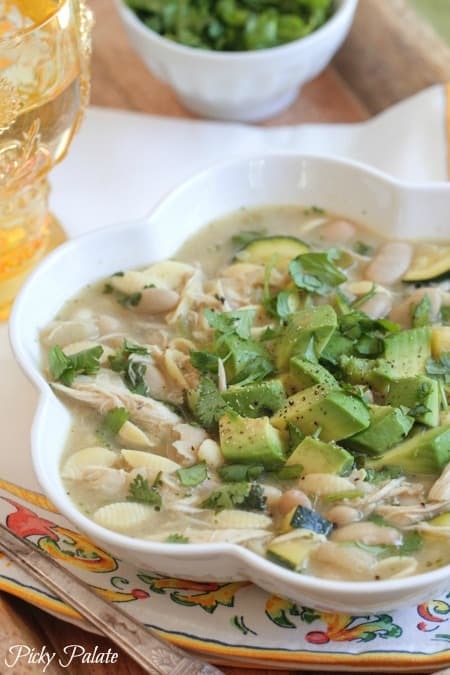 What you will find is lots of vegetables, chicken, cumin, spices, lime, cilantro and diced avocado on top. This was such a favorite dinner for us last week. We ate it for days. Break out your crock pot and enjoy!! Here’s a look at all of the ingredients I used. A large onion and garlic to start. 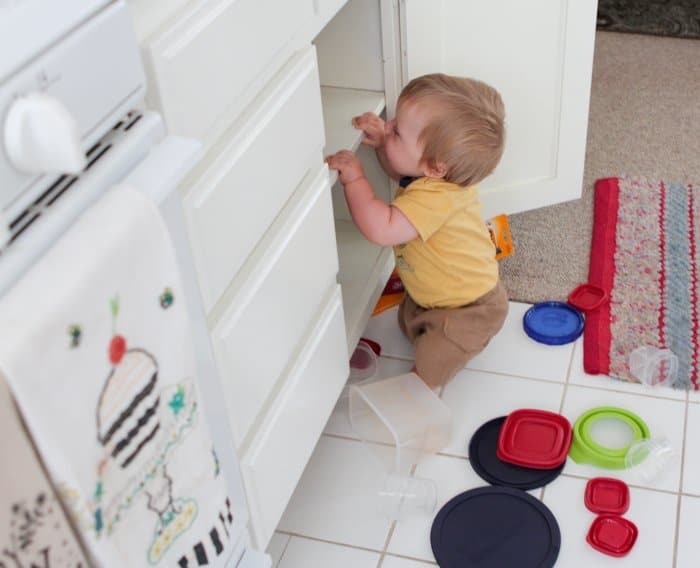 Oh boy, Pax has found the tupperware cupboard. He’s always in the kitchen with me, tidying up haha. 2 large or 4 small zucchini and a green bell pepper. Cooked shredded chicken and white beans. Transfer to a large crock pot. 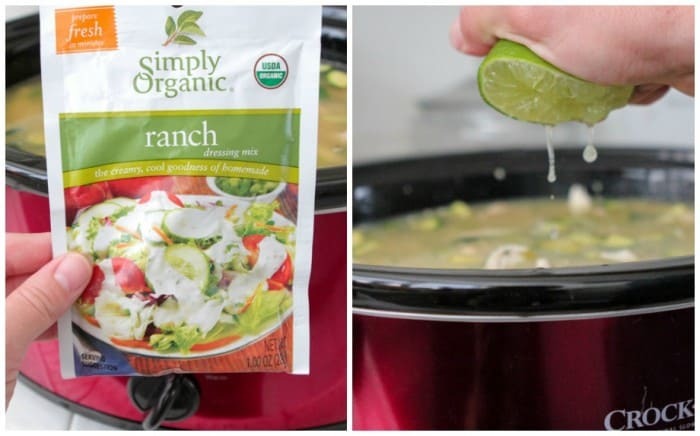 Add 1 package of Ranch Seasoning packet plus fresh lime juice. I found an organic all natural Ranch mix at Whole Foods, yay! Some cumin, garlic salt, salt and pepper to season. With the crock pot on high add your pasta and let cook for 2 hours. Once al dente, reduce heat to low. Right before serving, add fresh cilantro. Mmm! 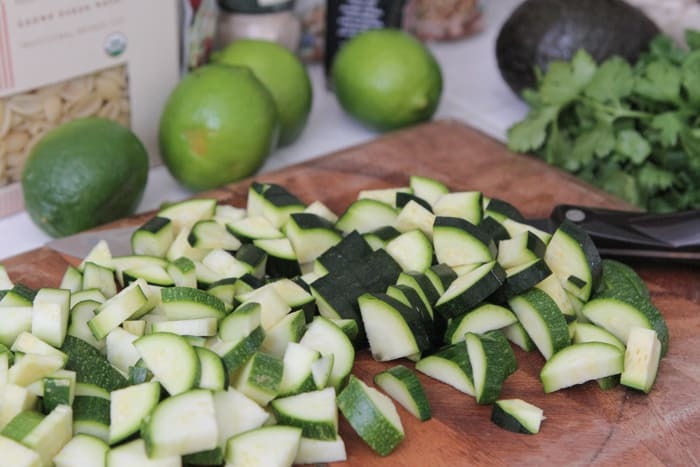 Add diced avocado to each bowl and enjoy! Heat oil in a large dutch oven over medium heat. Saute onions and garlic until softened, about 5 minutes. 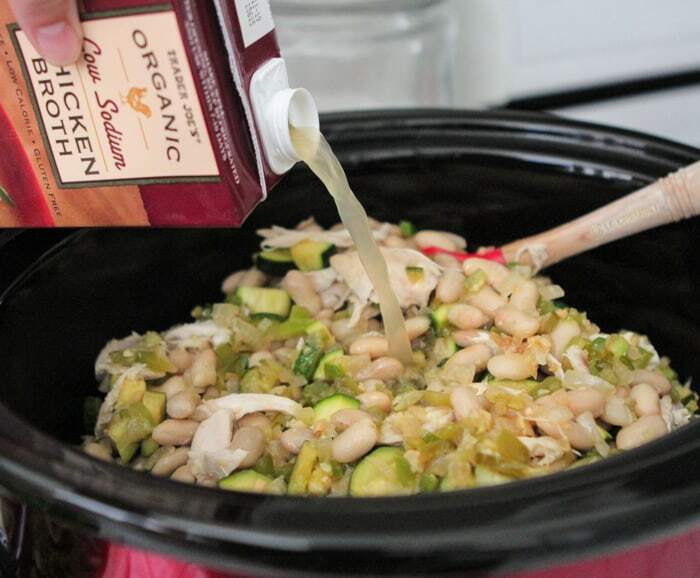 Stir in Anaheim peppers, zucchini, green bell peppers, chicken and beans. Saute for 10 minutes, stirring often. Transfer to a large crock pot over high heat. Add broth, Ranch seasoning, lime juice, cumin, garlic salt, salt, pepper and pasta. Close lid and let cook for 2 hours on high. Reduce heat to low or warm. Right before serving stir in cilantro and top each individual bowl with diced avocado. That looks AMAZING! We are a big white chili family. I never even thought to add noodles. Can’t wait to try this version. 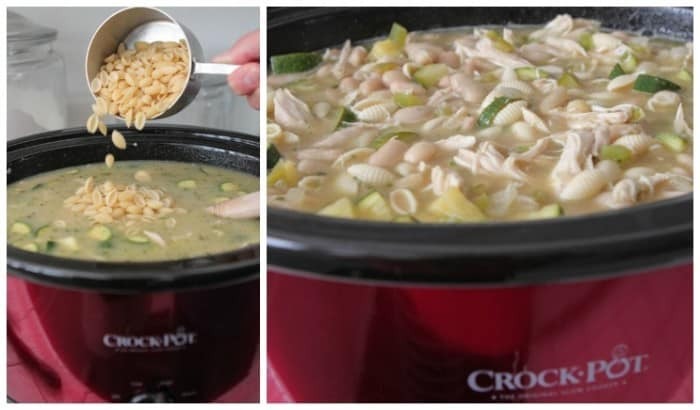 LOVE using my crockpot in the summer. This is such a fabulous and Summery spin on chili!! This soup sounds wonderful, Jenny! Mmm!! Sounds so good. I would love a bowl for dinner tonight! 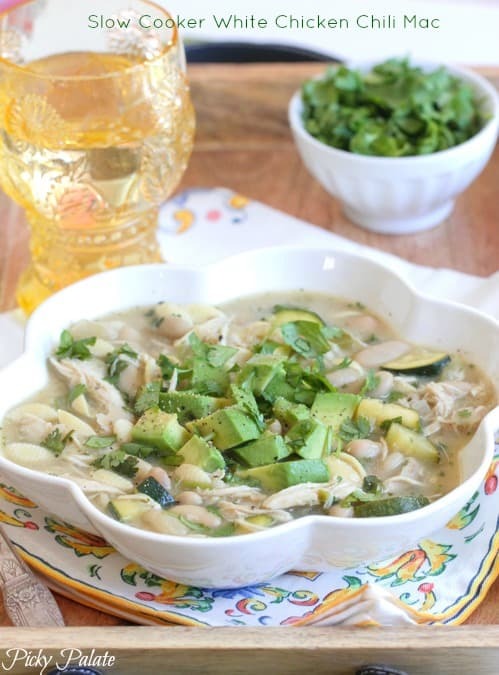 I like white chicken chili more than just the regular stuff. Like that you added pasta to yours. Totally want to try this. 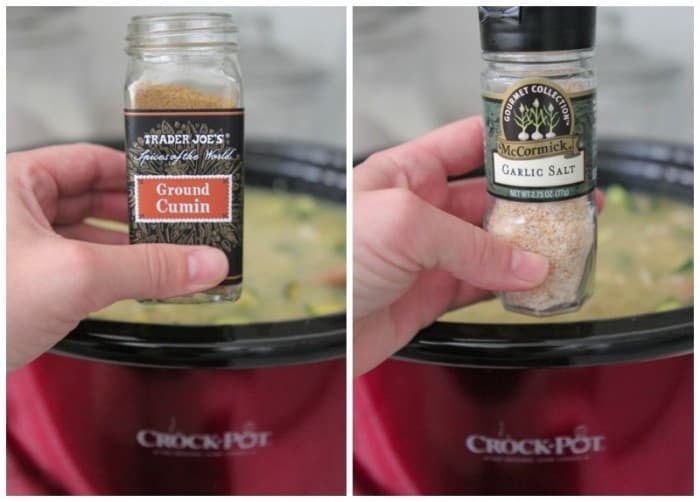 I am all over the slow cooker right now, but I love how this can totally be made any time!!! No oven – yes, please! And it looks delicious – I’m in! I love slow cooker meals!! and this one looks great! HECK YES!!! I am coming over for this next time you make it!! That looks great! I might try adapting to cook on the stovetop. I’ll take a few bowls of this please!! It looks amazing! Is it really 1/4 Cup of Cumin? Sounds like a lot but I admit, I love Cumin. Just wanted to be sure. 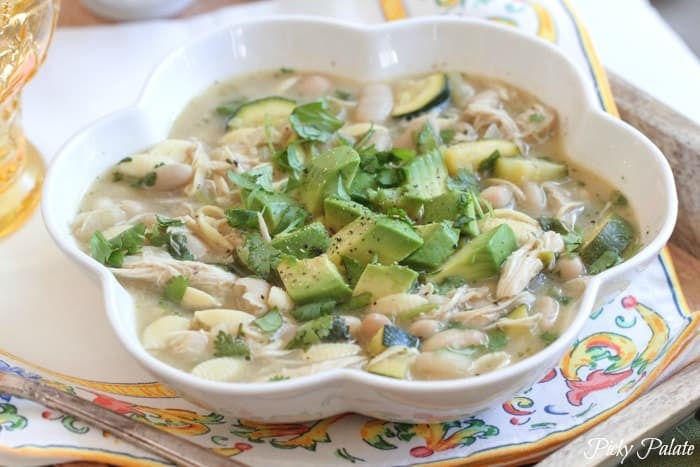 This is a fab family meal & I LOVE all the avocado! This looks amazing, your pictures scream fresh! They also scream “eat me” because I really want this dish! This sounds so delicious! Love how it has lots of zucchini in it! I think my family would eat it up! On a different topic. Even if I found this blog listed as one of wordpress blogs, I really hate when I can’t find a typical Follow function on its usual place! Can’t wait to make this. WOWWwww. How long would you cook if on low? This sounds delicious! I love your kitchen towel! Where did you get it? How long do you keep it on low, after you have cooked it on high 2 hours? Does it still need to cook more? Will the pasta get too soft if you keep it on low for a few hours (after the 2 hours of high)? 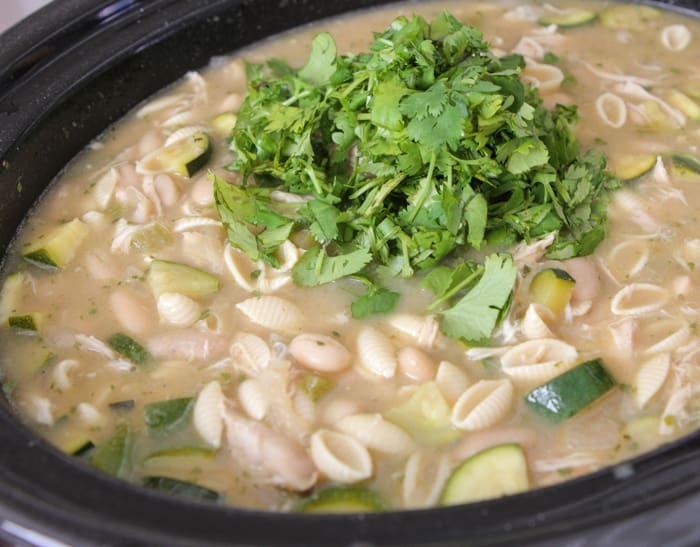 I am the same – I love the slow cooker in the summer so I don’t have to heat up the house! This looks so good! 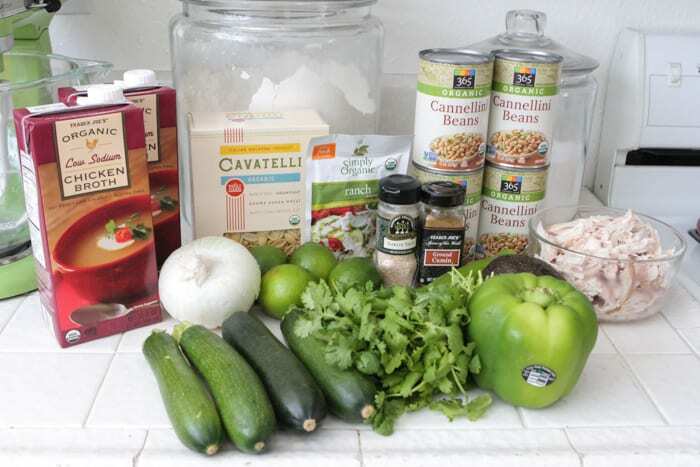 This is currently in my crockpot for dinner tonight! I am having my husband’s guy friends over and thought it’d be a good rainy day meal. I have to admit that I had to come back on here to check that it said 1/4 cup of cumin, because I’ve been worrying it was tsp and I read it wrong. I added 1/8 to be safe. I put mine on low and just had my husband add the noodles, since work didn’t allow me to do 2 hours. Excited to try it, thanks for the great recipe! The addition of pasta & ranch seasoning has me intrigued. Yum! And of course I’m always on the lookout for a great slow cooker recipe. Looks delicious! I just got your book and flagged several recipes to try soon–love it!! Ever since you posted a picture of the Kate Spade crossbody bag (the pink and orange one) in one of your chit chat posts this spring I have been WANTING if ….ha ha… Well, now I finally have a little extra to spend on myself (most of our money is spent on the kiddos LOL)… But before purchasing it I just wanted to ask you if you still love yours as much as when you bought it, or have you changed your mind about it? And is yours the smaller (Tenley) or the larger (Cora) version of this bag? Looks delicious. Cant wait to try! After the 2 hours on high, how much longer does it need to be cooking on low? Hi, I made this yesterday, and the pasta was really overcooked. Any suggestions? Thanks! With the beans, do you drain the juice or add it? 1/4 cup of cumin? is that right? had the chance to see his Blogging to the Bank series of ebooks. Made tonight…so delicious! It was hit with my 3 young kids too (minus the cilantro)! 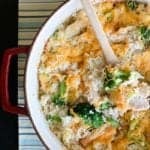 I will definitely be making this again…and freezing the leftovers because this recipe made enough for about 10 people. Highly recommend!